It's the second Christmas 2017 related post and the first gift guide for 2017 on the blog. Whether you are looking to buy gifts for your mom, daughter, sister, wife or friend, I hope these products that I have curated will help you find that perfect present. Olverum is a highly concentrated, therapeutic bath oil which contains 10 pure essential oils (Juniper, Lemon peel, Eucalyptus, Rosemary, Lavender etc.) that work together to naturally and effectively relieve stress. It is also a great way to ease aching or sore muscles. The bath oil has a wonderful aromatic scent and is free from preservatives and artificial colours. It is truly a relaxing and therapeutic luxury product. If you know of someone who loves luxurious bath products, then a bottle of Olverum bath oil is sure to please them. The 125ml bottle retails at £29.00 while the 250ml bottle is priced at £53. There is even a travel set priced at £19. The main stockists for Olverum are Liberty, Conran, Harvey Nichols and Fenwick. For the music lover, trendy headphones would make a good gift choice and the Positive Vibration 2 Wireless headphones from the House of Marley are just the right pick. Available in Black (featured), Denim and Silver, these headphones have a 10-hour battery life, 40mm dynamic driver and aluminium ear cups. The trendy and sleek design with removable mic and 1-button remote means that these could be your perfect travelling companion. In addition to the sound quality which is very good, what I liked most about these headphones was the foldable design and the plush ear cushions - so comfortable - a perfect fit for my head and ears! 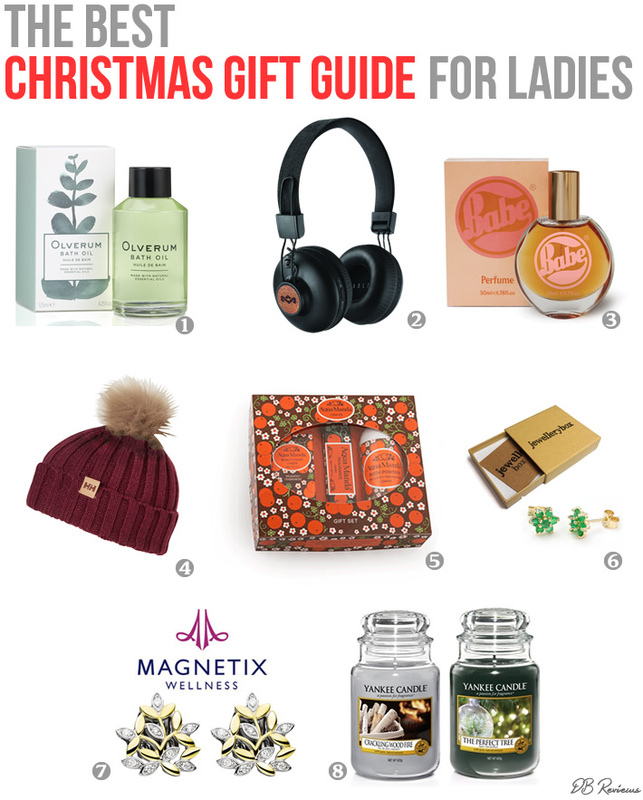 This time there are 2 jewellery brands included in the gift guide - both lovely albeit different. The first one is JewelleryBox who are an online jewellery retailer based in South London. Launched in 2014 they have an impressive range, with over 10,000 unique pieces of sterling silver & 9ct gold jewellery for buyers to choose from. An interesting addition to this year's gift guide and the second jewellery brand to be featured is Magnetix. Founded by Dr.Petra Doring, Magnetix is a jewellery brand that uses the powerful and positive effects of magnets. Because of their therapeutic properties magnets have been used in jewellery making for a very long time. Over the years, the designs have improved and the pieces offered by Magnetix not only act as an alternative method of treating certain ailments but they make elegant jewellery pieces as well. Magnetix offers a wide range of products - bracelets, necklaces, earrings, anklets, rings, watches and even magnetic dog mats and collar jewellery - all designed for improved health and inner harmony. While this is wonderful thought, the degree of efficacy cannot be measured in daily life. But if you look at the jewellery from Magnetix, they are beautifully crafted pieces in their own right and I consider the added benefit of your well-being as an additional bonus. If you are buying for a candle/home fragrance fan, then the new festive fragrance collection from Yankee Candle - The Perfect Christmas - would make an ideal gift. There are four fabulous fragrances in the new collection, all designed to fill your home with the scents and memories of a traditional family Christmas. The four new scents include: The Perfect Tree (a beautiful unique Alpine smell that captures the scent of the perfect tree - balsam and fir - scented with festive snowy branches), Christmas Magic (the combination of classic Christmas scents - balsam and pine - this fragrance will add a special something to any home during the festive period), Crackling Woodfire (with hints of warm cedarwood kindled with sweet whispers of nutmeg and warm amber, this scent will make you want to cosy up with your family) and Spiced White Cocoa (a sweet treat of indulgent cocoa topped with scents of whipped cream and a hint of nutmeg, this one is a warm, spicy and comforting fragrance). I had the opportunity to try 'The Perfect Tree' and 'Crackling Woodfire' and I have to say both are perfect for the festive season. They just smell like Christmas! Of the two, 'Crackling Woodfire' was my favourite. It makes my home smell so beautiful and welcoming. A fun and lovely Snowman T-Shirt (in a fitted style) that will get the recepient into the Christmas spirit in no time. This lovely T-Shirt from Lush T-Shirts, has a slim fitting and a simple yet lovely Snowman print. It is available in sizes Small through to XXL and is good value for money. The T-Shirt is well made, nice material and good quality. Thank you to all the brands who worked with me in creating this gift guide. Post contains PR samples, but as always, all opinions remain solely my own.